Next up for the Artist Feature part of the site is Ed Tillrock! Ed’s talent with any artistic medium is staggering to someone like me that struggles with stick figures but when he has a pencil in his hand he’s just downright amazing. Ed produces pencil drawings that you will swear are some sort of Photoshop manipulation of a black and white photo, but I’ve sat and watched the man create these amazing images on blank paper. It’s nothing short of amazing. Q: Do you remember an “ah-ha” moment that made you know that art was going to be an integral part of your life? A: As a kid I wanted to be an architect, but loved to draw! The “ah-ha” moment came in High School in an architecture class. I discovered Architectural Rendering! Art and architecture… A perfect fit for me…. I became a renderer! 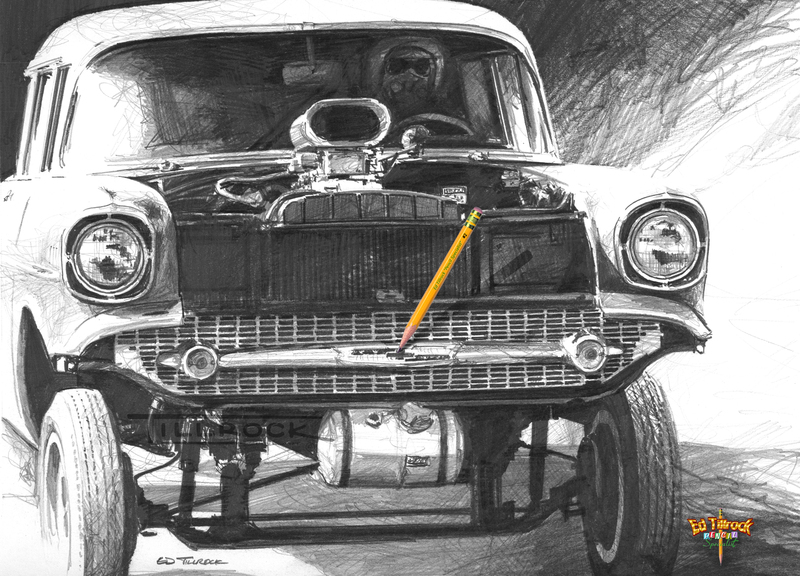 Did that for over 30 years, until the wheels came off the economy… It turned out to be a good thing for me… About 6 years ago I merged my passions for art and hot rods. I work more now than I ever have, but it’s not work! 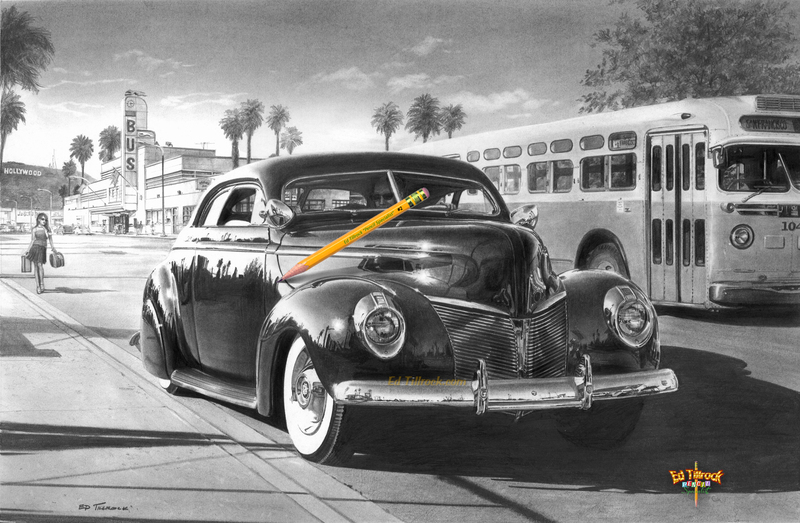 It’s a labor of love… Drawing with a regular #2 pencil is what I have done my whole life. 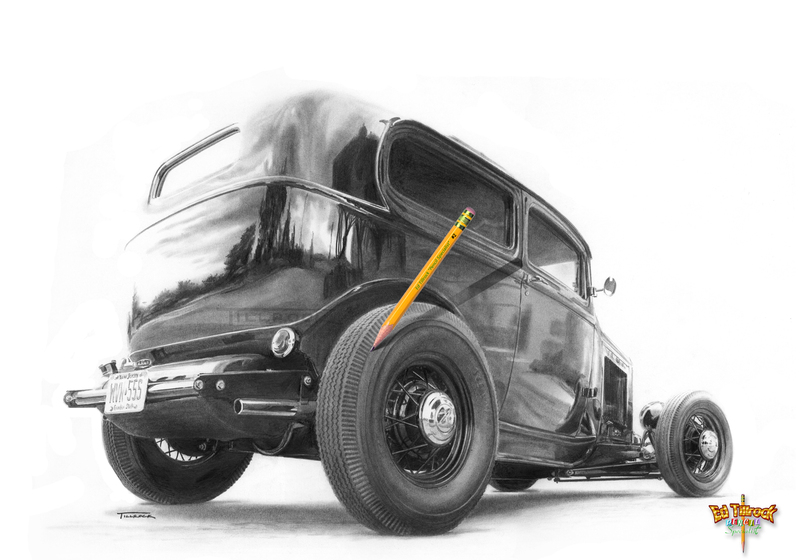 It was a natural progression for me to scribble hot rods with graphite on illustration board. I love the depth and richness I get with it. I treat my art as if it’s oil on canvas, but it’s all pencil! Q: If you could pick 1 piece of your work that would represent the entire body of your work, which one would you choose? Q:Who or what most inspires your work? Max (World-Wide) Grundy is such an energizing force. He never stops! His passion for his art is unbelievable. I could also add, Kenny Youngblood, Steve Stanford, Chip, Frank Lloyd Wright, and of course Norman Rockwell…. Q: What’s 1 piece of advice you’d give an artist that’s just starting out today? A: Learn to draw by hand! Computers are fantastic, but before you can run you need to walk. The basics are important…. And draw every day!!! Thanks Ed for taking the time to answer the questions and for sharing some of your art with all of us! Folks, go to Ed’s site, buy his art, it’s that simple and makes amazing Christmas gifts. Make sure to subscribe to the blog at the top right hand corner of the site. Just enter your email address and you’ll get the newest posts as soon as they go live on the site. 2014 Calendar For Charity Update: 10 Greaserama Edition and 25 Trucks Edition Get your copies now, they make great Christmas gifts!